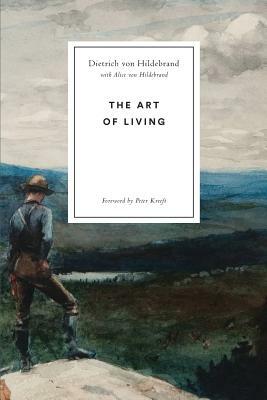 A book of everyday ethics by a man whom Pope St. John Paul II called "one of the great ethicists of the twentieth century," The Art of Living is Dietrich von Hildebrand's essential guide to the moral life. In just over one hundred pages, Dietrich von Hildebrand, with his wife Alice, presents a distinctive view of the virtuous life that begins with reverence, "the mother of all virtues," and includes chapters on "Faithfulness," "Goodness," "Hope," "The Human Heart," and many others. The essays that make up this book began as a popular series of radio lectures in 1930s Germany, and their conversational tone comes through in this new edition, which maintains Alice von Hildebrand's original translation, and updates this beloved work for a new generation of readers. "The author is true to his title. Hildebrand writes about virtue with an artist's flair. He shows us the moral life as it is -- and so we can see the overwhelming appeal of every virtue, every value. It is the art of living virtuously that makes love possible and leads us to friendship and communion - with God and neighbor. A better life, the life we want, begins in these luminous pages." -- Scott Hahn, bestselling author of over forty titles, including The Lamb's Supper and Reasons to Believe. "The essays in Dietrich von Hildebrand's The Art of Living are a sublime treasury, filled with light and truth. Whoever longs to live fully and truly will do well to discover and cherish this golden book." "The primacy of moral virtue has never had a more passionate, insightful--and bracing-- champion in the modern era than Dietrich von Hildebrand. Men and women of all faiths should celebrate the reissue of this inspired volume."